These problems provide further practice for both parts of Section II of the examination. Part A. Directions: A graphing calculator is required for some of these problems. 1. A function f is continuous, differentiable, and strictly decreasing on the interval [2.5,5]; some values of f are shown in the table above. (a) Estimate f ′(4.0) and f ′(4.8). (b) What does the table suggest may be true of the concavity of f ? Explain. (c) Estimate with a Riemann sum using left endpoints. (d) Set up (but do not evaluate) a Riemann sum that estimates the volume of the solid formed when f is rotated around the x-axis. 2. The equation of the tangent line to the curve x2 y − x = y3 − 8 at the point (0,2) is 12y + x = 24. (a) Given that the point (0.3,y0) is on the curve, find y0 approximately, using the tangent line. (b) Find the true value of y0. (c) What can you conclude about the curve near x = 0 from your answers to parts (a) and (b)? (a) Describe the symmetry of f.
(b) On what intervals is f decreasing? (c) For what values of x does f have a relative maximum? Justify your answer. (d) How many points of inflection does f have? Justify your answer. 4. 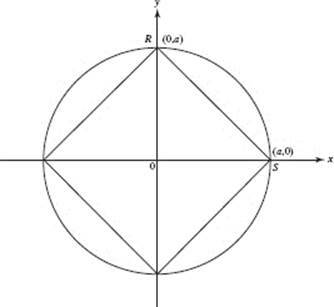 Let C represent the piece of the curve that lies in the first quadrant. Let S be the region bounded by C and the coordinate axes. (a) Find the slope of the line tangent to C at y = 1. (b) Find the area of S.
(c) Find the volume generated when S is rotated about the x-axis. 5. Let R be the point on the curve of y = x − x2 such that the line OR (where O is the origin) divides the area bounded by the curve and the x-axis into two regions of equal area. Set up (but do not solve) an integral to find the x-coordinate of R.
6. Suppose f ″ = sin (2x) for −1 < x < 3.2. (a) On what intervals is the graph of f concave downward? Justify your answer. (b) Find the x-coordinates of all relative minima of f ′. (c) How many points of inflection does the graph of f ′ have? Justify your answer. 7. Let f (x) = cos x and g(x) = x2 − 1. (a) Find the coordinates of any points of intersection of f and g.
(b) Find the area bounded by f and g.
8. (a) In order to investigate mail-handling efficiency, each hour one morning a local post office checked the rate (letters/min) at which an employee was sorting mail. Use the results shown in the table to estimate the total number of letters he may have sorted that morning. (b) Hoping to speed things up a bit, the post office tested a sorting machine that can process mail at the constant rate of 20 letters per minute. The graph shows the rate at which letters arrived at the post office and were dumped into this sorter. (i) When did letters start to pile up? (ii) When was the pile the biggest? (iii) How big was it then? (iv) At about what time did the pile vanish? (c) the volume of the solid formed when R is rotated around the x-axis. (a) If there are 7.48 gallons of water per cubic foot, what is the capacity of this tank to the nearest thousand gallons? Note: Scales are different on the three figures. 11. 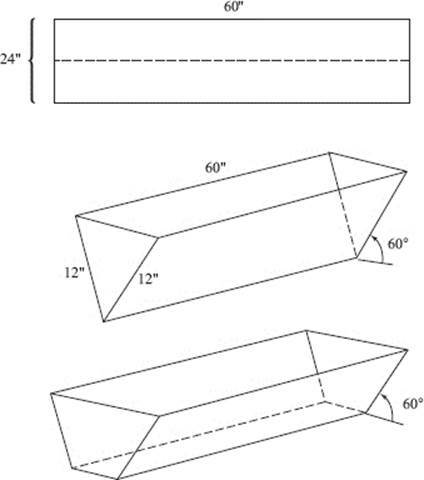 The sides of a watering trough are made by folding a sheet of metal 24 inches wide and 5 feet (60 inches) long at an angle of 60°, as shown in the figure above. Ends are added, and then the trough is filled with water. (a) If water pours into the trough at the rate of 600 cubic inches per minute, how fast is the water level rising when the water is 4 inches deep? (b) Suppose, instead, the sheet of metal is folded twice, keeping the sides of equal height and inclined at an angle of 60°, as shown. Where should the folds be in order to maximize the volume of the trough? Justify your answer. to approximate tan−1 1/5, and the polynomial of degree 1 to approximate tan−1 1/239. (c) Use part (b) to evaluate the expression in (a). (d) Explain how the approximation for π/4 given here compares with that obtained using π/4 = tan−1 1. 13. (a) Show that the series converges. (b) How many terms of the series are needed to get a partial sum within 0.1 of the sum of the whole series? (c) Tell whether the series is absolutely convergent, conditionally convergent, or divergent. Justify your answer. (b) Express y as a function of t.
(c) For what value of t will y = 8? (d) Describe the long-range behavior of y. (a) Where is P when t = 4? (b) What is the vertical component of its velocity there? (c) At what rate is its distance from the origin changing then? (d) When does it hit the x-axis? (e) How far did it travel altogether? (a) Sketch the path of the particle, indicating the direction of motion. (b) At what time t does the particle reach its highest point? Justify. (c) Find the coordinates of that highest point, and sketch the velocity vector there. (d) Describe the long-term behavior of the particle. 17. 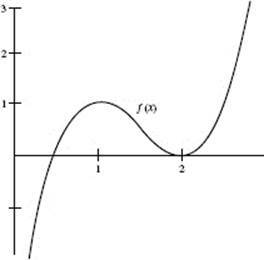 Let R be the region bounded by the curve r = 2 + cos 2θ, as shown. (a) Find the dimensions of the smallest rectangle that contains R and has sides parallel to the x- and y-axes. Part B. Directions: Answer these questions wtihout using your calculator. (1) f ′(−1) = f ′(1) = 0. (2) If x < −1, f ′(x) > 0 but f ″ < 0. (3) If −1 < x < 0, f ′(x) > 0 and f ″ > 0. (4) If 0 < x < 1, f ′(x) > 0 but f ″ < 0. (5) If x > 1, f ′(x) < 0 and f ″ < 0. 19. 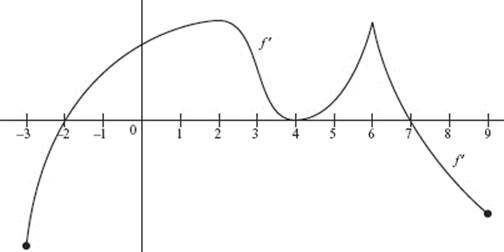 The figure below shows the graph of f ′, the derivative of f, with domain −3 ≤ x ≤ 9. The graph of f ′ has horizontal tangents at x = 2 and x = 4, and a corner at x = 6. (a) Is f continuous? Explain. (b) Find all values of x at which f attains a relative minimum. Justify. (c) Find all values of x at which f attains a relative maximum. Justify. (d) At what value of x does f attain its absolute maximum? Justify. (e) Find all values of x at which the graph of f has a point of inflection. Justify. 20. Find the area of the largest rectangle (with sides parallel to the coordinate axes) that can be inscribed in the region bounded by the graphs of f (x) = 8 − 2x2 and g(x) = x2 − 4. 21. Given the graph of f (x), sketch the graph of f ′(x). 22. A cube is contracting so that its surface area decreases at the constant rate of 72 in.2 /sec. Determine how fast the volume is changing at the instant when the surface area is 54 ft2. 23. A square is inscribed in a circle of radius a as shown in the diagram. Find the volume obtained if the region outside the square but inside the circle is rotated about a diagonal of the square. 24. (a) Sketch the region in the first quadrant bounded above by the line y = x + 4, below by the line y = 4 − x, and to the right by the parabola y = x2 + 2. (b) Find the area of this region. 25. The graph shown below is based roughly on data from the U.S. Department of Agriculture. 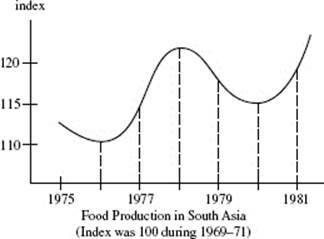 (a) During which intervals did food production decrease in South Asia? (b) During which intervals did the rate of change of food production increase? (c) During which intervals did the increase in food production accelerate? 26. A particle moves along a straight line so that its acceleration at any time t is given in terms of its velocity v by a = −2v. (a) Find v in terms of t if v = 20 when t = 0. (b) Find the distance the particle travels while v changes from v = 20 to v = 5. 27. Let R represent the region bounded above by the parabola y = 27 − x2 and below by the x-axis. Isosceles triangle AOB is inscribed in region R with its vertex at the origin O and its base parallel to the x-axis. Find the maximum possible area for such a triangle. 28. (a) Find the Maclaurin series for f (x) = ln(1 + x). (b) What is the radius of convergence of the series in (a)? (c) Use the first five terms in (a) to approximate ln(1.2). (d) Estimate the error in (c), justifying your answer. 29. A cycloid is given parametrically by x = θ − sin θ, y = 1 − cos θ. 30. Find the area of the region enclosed by both the polar curves r = 4 sin θ and r = 4 cos θ. 31. (a) Find the 4th degree Taylor polynomial about 0 for cos x. (c) Estimate the error in (b), justifying your answer. 32. A particle moves on the curve of y3 = 2x + 1 so that its distance from the x-axis is increasing at the constant rate of 2 units/sec. When t = 0, the particle is at (0,1). (a) Find a pair of parametric equations x = x(t) and y = y(t) that describe the motion of the particle for nonnegative t.
(b) Find |a|, the magnitude of the particle’s acceleration, when t = 1. 33. 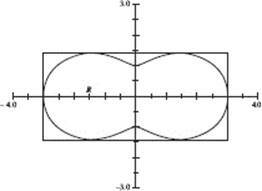 Find the area of the region that the polar curves r = 2 − cos θ and r = 3 cos θ enclose in common.